When Brad Pitt comes on TV to advertise Chanel No. 5 perfume, it just doesn't sit right with me. I think it's partly because the ad is so oddly mysterious, but it's also because Brad Pitt just doesn't look like he used to. In fact, I hardly recognized him at first with his long, flowing hair and all the whiskers coming from every point on his face. Anyway, Chanel No. 5 is special to me because it's the first perfume I ever wore. I remember gazing longingly at the glass case at our drugstore, wishing I could have the black canister with the gold trim for myself. More than once, I was reprimanded by the druggist's wife for using too much of the sample spray cologne on the counter. I must have been in the sixth grade then. I guess it was the next year that I opened a package from under the Christmas tree, and there it was - an entire set, including the powder. I remember the squeaky feel of the white box with black writing. I loved that fragrance. It represented everything sophisticated to me, and day dreamer that I was, I pictured myself at a Hollywood party, dancing with Ricky Nelson and Frankie Avalon, both of them intoxicated by my heavenly perfume. I pretty much wore Chanel No. 5 (actually the watered down cologne spray) to every event from then on, all the way through high school. In college, when everyone went abroad, the perfume to have was Joy. I bought some at a hole in the wall discount place off the Rue de Rivioli, but I didn't like Joy. I let mine sit for years, unused. I went though a L'air du Temps phase for decades. Presently, I have some Jo Malone concoction that makes me smell like grapefruit. According to my daughter, it's supposed to be "fresh and young", neither of which I am. Nothing has ever come close to the feeling I had with that initial Chanel No. 5, though it wouldn't work for me nowadays. I seldom wear any fragrance anyway. But enough about perfume. what on earth is this picture with the bag lady on the right? (Note: those are not mom jeans, but a faded pair of gardening pants I was attached to at the time). 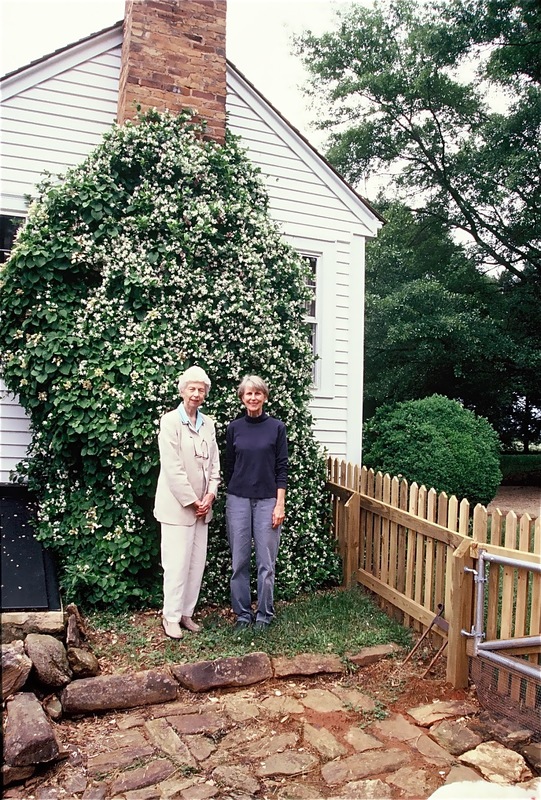 This was taken over twenty years ago in front of an original stand of Trachelospermum jasminoides 'Madison', a particularly fragrant selection of star jasmine made by Jane Symmes, pictured on the left, a knowledgeable plantswoman who introduced many important plants to the trade. The vine is growing on her early 19th century house near Madison, Georgia. Jane, who ran a wholesale nursery at her farm, noticed that this particular star jasmine tolerated more cold than the species and produced a prolific amount of blooms. Hardy as far north as Atlanta, the vine is at its peak around the first of May, and then blooms sporadically during the season. It's from China and Japan, although in the South, it's known as Confederate jasmine. So, why am I writing about this now? It's not really a good time to plant this evergreen vine, with winter coming on. It's just that with so many perfume ads on TV, I began thinking about all the plants there are that lend wonderful scents to the garden. If you plan carefully, at least around here, you can have some sort of fragrant flower almost every month of the year. And, ever mindful of what things cost, I figure for the price of a bottle of Jo Malone's special blends, I could buy at least three good-sized fragrant plants that would give me the same thrill as that first bottle of Chanel No. 5. God bless the butterfly jasmine and paperwhites for making Christmastime in the South smell like heaven. I have a cutting from this plant that I purchased at Wilkerson Mill Gardens about 15 years ago. They described it to me as cold hardy and coming from Madison GA. Nice to see where it originated! Neighbors and the mail lady always comment on it!